Glass looking or money digging was a thing in Joseph Smith’s time. People would say they could look into a rock and find treasure buried in the ground. At age 13, Joseph was introduced to this by a classmate Sally Chase, who had a green stone that she claimed she could see treasure with. He used her stone to find his first seerstone, a “chocolate colored” smooth oval shaped rock that would become his favorite seerstone. 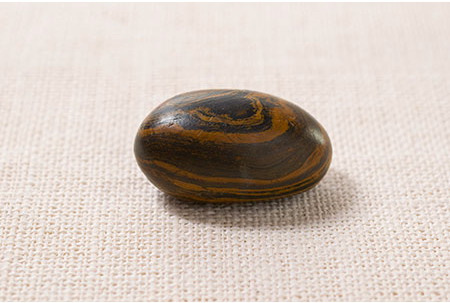 He used this on treasure hunting expeditions as a youth and then later used it as one of the seerstones he used in his role as a prophet, translating the Book of Mormon and receiving revelations of the Doctrine and Covenants. The LDS Church released photographs of this stone in August 2015. As other money diggers did, he would take the stone, put it in a hat, bury his head in the hat to block the light out. Then he would look into the stone which would light up and show a scene, such as the earth below the ground which sometimes would show buried treasure. There were legends that early Spanish colonizers hid gold and other treasure in the area. Many people believed this was a legitimate skill. Many people believed it was a con. A common version of the con goes like this: the person would look through the seerstone and identify buried treasure on the person’s land, then the person would pay to continue to expedition, people would dig down and get close to the treasure, there would be excitement, as the person would say “you’re getting closer”, then as they got close, the person would say “oh, shoot, the treasure just slipped lower into the ground”, and they would give up digging or keep digging and this would be repeated until the land owner gave up. Joseph was known to do this on at least one occasion and was charged and went to court over this crime. Prophets are human and we know Joseph wasn’t perfect. But what becomes especially challenging is that it’s very fuzzy where the magic and the conning stopped and when the prophetic, divine work started. The same stone and the same method that he used to con people, he used to translate the Book of Mormon. There is also evidence that Joseph first talked about the Angel Moroni and the finding of the gold plates as a magical journey, evolving over time into the cleaner version we know today. In some accounts, Angel Moroni seems to be playing the part of a classic treasure guardian spirit, acting as a trickster, asking the treasure seeker riddles and questions, making them perform challenges and come back later, shocking the person if they get too close to the treasure, and so on. When Moroni gave Joseph the Gold Plates, they came with the Urim and Thumim, or what Joseph referred to as the Nephite spectacles. Joseph never talked about how the Book of Mormon translation process went. We have a few quotes from Martin Harris, Emma Smith, David Whitmer, and Oliver Cowdery that suggest something like this: for the first 116 pages that were lost that Martin Harris was the scribe for, Joseph used the head in hat technique using the Nephite interpreters, aka Urim and Thummim, as substitute for the seerstone. After that, and for the majority of the Book of Mormon, he used the same head in hat technique, but was openly using the same peepstone that he had carried since he was a teenager and used in money digging schemes. While he was translating, the gold plates were typically not present, hidden for fear people would steal them, or covered with a napkin. Many LDS grew up with a belief in the BOM translation process as the one on the right, while research and newer information being validated by the church suggests it’s the process on the left. Editor note: commenting just two years after this was first written in 2015, this already is feeling out of date. The Church has done much in just two years to become open on this topic. More insight into the Book of Mormon translation process might come from the original Book of Commandments. In it, Joseph is receiving revelation from God telling Oliver he is blessed with a gift of a divining rod. Oliver had a wooden divining rod. Divining rods were believed to have power to help farmers locate where to dig to find water. God tells Oliver to take a shot at translating the Book of Mormon using the divining rod. In the next chapter God chastises Oliver for failing. The reason he failed was that he thought God would give him the translation. What God wanted was for Oliver to study it out, then ask God if it was right, and then if it was confirmed with a burning in his bosom, he would know it was right. This confirms the magical aspect of the translation, but also confuses the issue of whether this was a loose or tight translation. A loose translation would help explain some of the challenges in the BOM content itself, while a tight translation makes it more difficult to accept these and maintain a literal view. Scripture is seen as metaphorical. Faith is an expression of loyalty, devotion, worship and doctrinal alignment but not necessarily a belief in the factual accuracy of scripture or historical religious origins. Challenges to scriptural historical events are not damaging to faith. I believe Joseph Smith was inspired by God to bring forth the restoration of the gospel, but there were most likely no gold plates given to him by Moroni from ancient American prophets. I believe Joseph felt called to be a prophet, but it’s possible he made mistakes in an attempt to bolster his credibility to others to execute the plan he felt deeply was his responsibility. I believe the fruits of Joseph’s work are true and beautiful. There is strong evidence that implies Joseph translated the BOM from gold plates. Among this is the first hand witness accounts, the speed of translation and creation of the BOM manuscript with no satisfying alternate theories, and the content of the BOM which is complex and seemingly above the head of the young, uneducated Joseph Smith. The “weirdness” of the translation account is due to the fact that God uses what is comfortable for his prophets. At the time, seerstones and a magical world view were what Joseph related to, and God took that and used it and gradually helped him understand the truth of what he was doing. Moroni commanded him to put his money digging behind and repent and not use the seerstone for nefarious means. Joseph took that seriously and transitioned from the immaturity of youth into a prophet of God. The actual reality lies somewhere in between the two above views. Some view non-literally. Some view literally, but with nuance to the historical account that makes sense of the weirdness in the historical record, including the possibility that Joseph made mistakes. Some view the gold plates as some sort of catalyst that helped Joseph tap into the revelatory spirit from God, similar to a Book of Abraham view. Some only look at the value of the Book of Mormon today and ignore history completely as it’s difficult to sort out with too many missing historical details. Some view the Book of Mormon as a 19th century work, brought forth in the mind of Joseph Smith the prophet, which he had a right to do as a prophet of God, sort of like Biblical midrash.